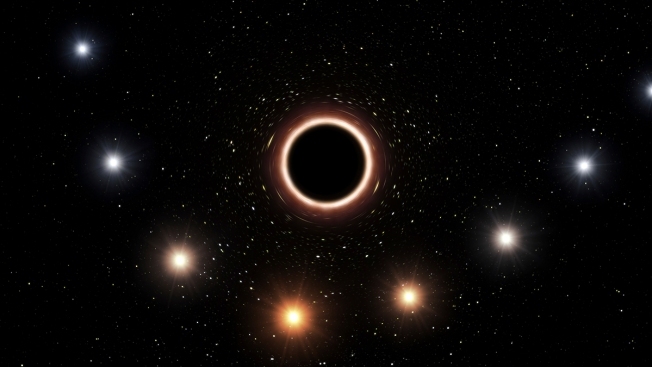 This artist's impression provided by the European Southern Observatory in July 2018 shows the path of the star S2 as it passes close to the supermassive black hole at the center of the Milky Way galaxy. As the star gets nearer to the black hole, a very strong gravitational field causes the color of the star to shift slightly to the red, an effect of Einstein's general theory of relativity. European researchers reported the results of their observations in the journal Astronomy & Astrophysics on Thursday, July 26, 2018. More than a century after Albert Einstein proposed it, his theory of general relativity has passed another test. "I, just like every physicist in the world, would have loved to finally see a crack in Einstein's relativity," said Ohio State University astrophysicist Paul Sutter. "But he's outsmarted us." But confirming Einstein's work — again, "feels like we're kind of beating a dead horse," said Sutter, who wasn't part of the research team led by Reinhard Genzel of the Max Planck Institute for Extraterrestrial Physics in Garching, Germany.